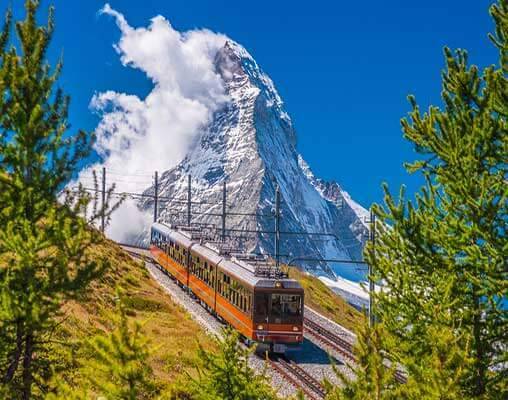 During our Swiss adventure, we enjoy thrilling mountain railways, charming towns and dramatic Alpine scenery for which Switzerland is justly famous. 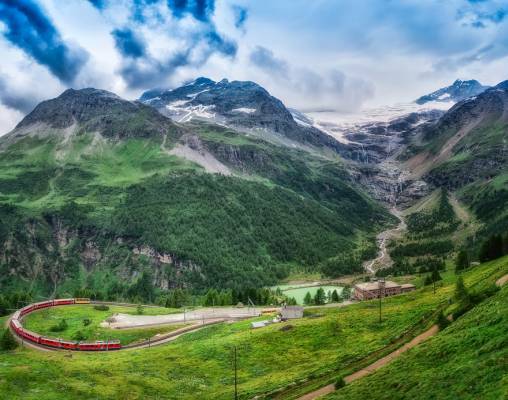 Stunning scenery and spectacular views are enough to take your breath away as we travel by rail through the heart of the Swiss Alps on the world-famous Glacier Express train. 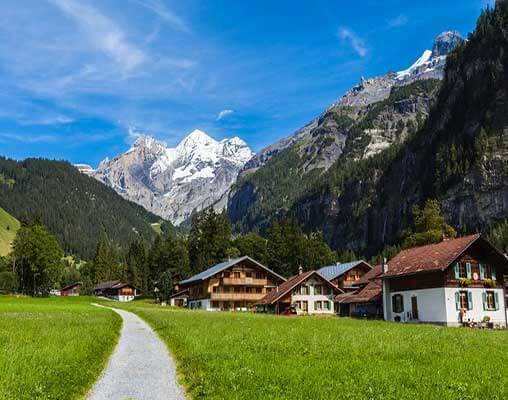 During our Swiss adventure, we enjoy thrilling mountain railways, charming towns and dramatic Alpine scenery for which Switzerland is justly famous. The friendly, 3-Star Hotel Freieck in Chur is situated in the heart of the Old Town. It is under the personal supervision of the Stockmann family, and is a popular choice amongst our customers. The hotel features a renovated vaulted restaurant, a cosy bar and a Wintergarden-café. Rooms are furnished in traditional Swiss style and are equipped with a television, telephone, hairdryer and a safe. The warm, welcoming, family-run 3-Star Belle Epoque Hotel Victoria is the oldest hotel in Kandersteg and is run by the charming Platzer family. The hotel has its own peaceful gardens and is located only a short walk from the railway station. Hotel facilities include an excellent indoor swimming pool, reading room, large lounge and residents' bar. The hotel's Art Nouveau restaurant enjoys terrific mountain views to accompany the mouth-watering cuisine. All rooms are equipped with a television, telephone, hairdryer, safe and tea/coffee making facilities. 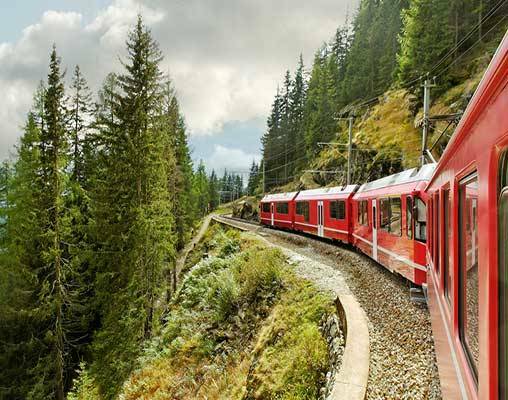 The narrow-gauge Bernina Express connects northern and southern Europe and offers a spectacular means of crossing the Alps. 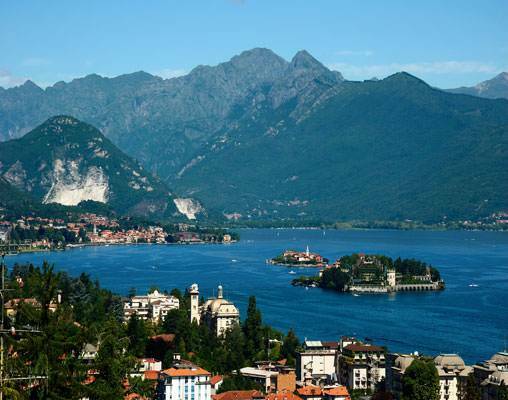 The route runs through the ancient landscape of Switzerland's beautiful Grisons/Graubünden region and provides essential links to the Italian-speaking population in the south. The Glacier Express is undoubtedly Switzerland's best known train. The 181 mile (290km) trip from Zermatt to St Moritz lasts around eight hours winding its way through some of Europe's most dramatic and beautiful scenery. Beginning in Zermatt, a pretty Alpine resort close to the Matterhorn, the Glacier Express glides northwards from under the shadow of the mighty Matterhorn and follows the Matter Vispa River and the Rhône Valley to Visp. The train then heads east to Brig, before climbing through Betten, Grengiols and Oberwald on its journey to the 9¼ mile (15km) long Furka Base Tunnel. The train emerges and makes its way to the village of Andermatt, before beginning its ascent towards the Oberalp Pass which at 6,670 feet (2,033m) is the highest point on the line. It then makes the steep descent towards Disentis, where the train is attached to an RHB locomotive. From here we pass the historic town of Ilanz, descending to the stunning Rhine Gorge where we continue on to the attractive cantonal capital of Chur. The high speed Eurostar trains link St Pancras International in London with Paris and Lille in France as well as Brussels in Belgium. Eurostar's Standard Class coaches feature two seats on either side of the central aisle, most of which is arranged in an 'airline' seating configuration with drop down tray tables. There are two tables for four per carriage. Passengers travelling in Eurostar Standard Class coaches can take advantage of the Bar-Buffet which sells a range of snacks, meals, hot and cold drinks - including Champagne! Click here to view testimonials for Traditional Glacier Express. Enter your details below if you would like to be notified when 2020 dates and prices are available for Traditional Glacier Express.